Purdy Hicks is pleased to present a solo exhibition by Charlotte Verity: the ﬁrst exhibition of her paintings in London since her show at The Garden Museum in 2011. Charlotte Verity's paintings come about slowly during many hours of intense looking and close observation. She is preoccupied by the changing nature of the visual world, natural light and the passing seasons. ‘In these paintings’, Edmund de Waal writes, ‘the seasons ebb is marked. They are a calendar, a series of poems tracing one full moment and then another.’ Her subjects, taken mainly from the natural world, are painted with a certain exactitude but her choice of imagery and handling of pictorial space together with her sense of colour give the ﬁnished paintings a resonance well beyond the things they depict. 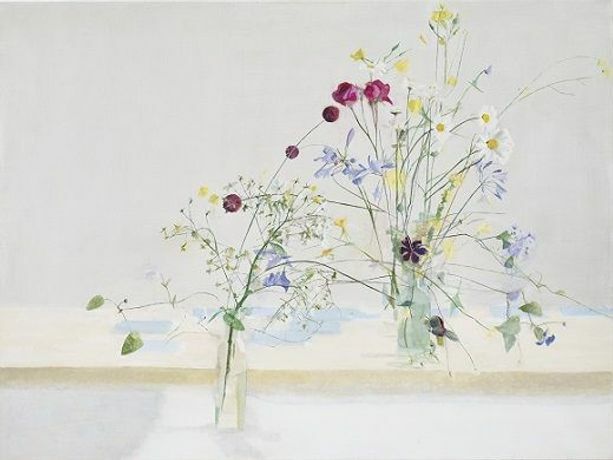 ‘Flowers for Charlotte Verity are what jugs and bottles are for Giorgio Morandi – vessels of light, markers of feeling’, the art historian Paul HiIls observes in his essay on this work. Ridinghouse will publish a monograph on Charlotte Verity to coincide with the exhibition for which Edmund de Waal has written an incisive and poetic response to her paintings. Paul Hills’ essay ‘Verity’s Sky’ is illuminating, and the published conversation with the artist Garry Fabian Miller draws out an honest account of the preoccupations of an artist painting today. Since studying at the Slade School of Fine Art, Charlotte Verity has exhibited regularly, and most recently with Purdy Hicks Gallery. She has had residencies at the Towner Art Gallery Eastbourne, The Garden Museum London and Flatford Suffolk. She has been teaching at the Royal Drawing School since 2001. Her work is in many public collections including University College London, Arts Council Collection, Sir John Soane’s Museum, Tate Education, The Garden Museum, and MoCA San Diego.